Ryuk watched Light with wonder. "Hey Light.... what happened? You've been smiling all day..."
"I've got them," he said with a smirk. "Two of those girls are now at Tokyo U and I have a feeling the third one will be there soon." ".....They're fake. Mino, Zen, and Rayne? Please. At least they're not totally brainless, though. This makes it more fun." "Heheheh... you're enjoying yourself, aren't you?" Ryuk asked as he hung upside down from the ceiling. "But what are you going to do now?" "I'm going to keep an eye on them," Light said while closing his and folding his arms behind his head. "They'll do something that confirms my suspicions eventually." "Hey, Light... is something wrong?" Ryuk asked on a rainy afternoon. "You haven't written a name down in the Death Note since forever. It's kind of boring." At that point Light's mother walked into the room to bring the clean laundry and Ryuk decided to float just in front of her, waving his hand in front of her face. "Light, you should close the window. I feel a chilly wind." She said. He waited until Light's mother had left the room. "If you no longer want it you can always give it back." He said with a dangerous glint in his eyes. Light was frustrated. Those damned girls were still around -- though he'd noticed the absence of Zen almost immediately when it occurred two years prior. He mentally cursed the fact that they were still able to properly function without her. When he found out their names Rayne would be the first to go for certain. "Ryuk, I'm not giving it back. I need to make careful choices with those damned girls still hanging about. They're certainly more clever than I'd like to admit." He snapped the pencil in his hand due to the sheer resentment he held towards them. "Hehehe... maybe you should kill someone unexpected... someone Kira would never kill... that might stir things up a little bit..." Ryuk said, with a low chuckle. Sometimes the Shinigami could be very disturbing, especially when he got bored. Soichiro lightly knocked upon the door of his son's room, realizing how he hadn't seen his face since yesterday night. 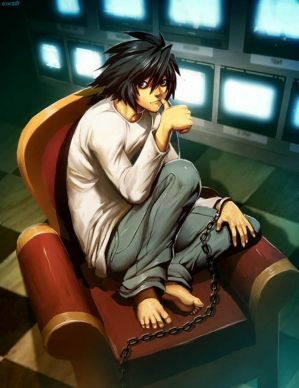 The older Yagami stared down at his feet, the stress upon his face evident from the long hours of work, in addition to bearing with the accusation of his son being Kira. "Light, are you busy?" Making sure that everything was as it should be and that the Death Note was tucked safely away, Light opened the door to his bedroom and smiled. "Not busy at all, dad." The sight of his smiling son just made the insecurities disappear from the detective's features. He put on a smile and shook his head. "At least spend some time with us; I know University's been taking away all your free time, but it won't hurt to spend a little family time either, right?" He placed a hand upon his son's shoulder. "It isn't like you're struggling with your education anyway; I'm confident you're doing alright." Light laughed. "I suppose you're right, dad. Sounds like a plan, then." Soichiro pat Light's shoulder before placing an apologetic look. "I wish I could've gotten the day off and catch up, but I have to head somewhere at 9." He raised an eyebrow towards his son. "You know, boys your age are usually out almost all the time. Don't you have any plans?" He was getting a little curious. Light was popular around his campus, so it was surprising how he spent almost all of his time in his room. "I do have some plans today actually. Lately I've just been getting my work done so I don't have to worry about it, but I'm taking time to just do out today." He grinned. Soichiro nodded in understanding. There was a brief moment of silence, and Soichiro's expression began to grow serious like his usual policec-look. "Listen, Light, there's something I need to ask." His voice was low and hesitant. "Do you..." He began his sentence, but it was hard to continue. He really didn't know what exactly to ask. So he simply shook his head and gave his son one final pat on the shoulder. "Nevermind; I forgot what I was going to ask. I better get ready, or I'll be late. You have fun." Light wondered what his father had wanted to ask, knowing that the older man hadn't forgotten. Soichiro had only taken a few steps until the ringing of his phone had stopped him once again. He swiftly brought it to his ear. "This is Soichiro." "Good evening, sir." He recognized the voice right away, even when it was a hushed one. The detective remained silent as the violet-eyed continued. "I just wanted to make sure; it's still at 9, right? No changes even with the way the sky's looking right now?" The detective nodded, even if he was certain she couldn't see it. "The rain won't harm us in any way." He explained. "Besides, we need to settle the matter right away. If those files still linger around, your life could potentially be in danger again." There was a low mumble on the other side of the phone; the detective's eyes grew slightly narrow. He didn't like her idea of keeping a secret side to her, but he couldn't just deny her request. It was more like he couldn't. She did not even demand an apology from the court when her case was finally settled. He wouldn't even think of allowing her to partake this role if he had no choice but to. "Let me find Kira with you." "Okay, then 9 it is." "I'll have Matsuda pick you up." He could sense her nodding on the other side. "Sorry...for wanting to be part of this. But thank you for understanding." And with that, she hung up. The detective could only sigh deeply. "Seems keeping secrets runs in the family," Ryuk said, "very interesting, hehehe." "It does seem to be that way." Light wondered what exactly his father was up to, but for now he would have to wait. He needed to bring Kira back into the picture and distract those girls in hopes of them making a mistake. Ryuk decided it would be interesting enough to follow the older Yagami, so without saying a word to Light he left the house to see where the man would go to. "Dear, I'm heading out now." The older Yagami announced once Matsuda's car came into view outside the window. "I'll probably be home a little late, depending on traffic, but take care." Soichciro opened up his umbrella and stared up at the sad sky for a brief moment. He had this weird feeling, like someone's eyes were on him, but he figured it was just the tiredness that was getting to him. As he opened the door, he did a double-back. "F-Fey, is that really you?" Fey smiled lightly before ushering the male inside. "Yes, yes, it's me." If Ryuk would have eyebrows he would have raised them in surprise right about now. This was the girl he had seen in the store with that brunette Light seems to hate so much. It was time to find out how these two knew each other and why they were meeting up.